How rigid will my Adjust-A-Bench be? 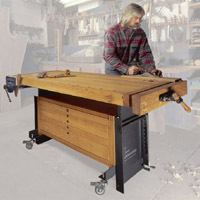 Can I perform heavy duty tasks on my Adjust-A-Bench such as hand planing? The Adjust-A-Bench leg system consists of two nesting trays, one of which slides up and down inside the other. The various height positions are maintained by a ratchet mechanism which automatically engages at each position. As the ratchet engages with a pair of teeth, a cam action is effected creating what has been described as a "gravity clamp." The downward thrust of your bench top is converted into a horizontal thrust which presses the two trays firmly together, making your bench surprisingly rigid. How do I adjust my Adjust-A-Bench? To raise your Adjust-A-Bench simply lift each end of your bench to the desired level. To lower your Adjust-A-Bench depress the foot pedal. Because of the safety spring attached to the foot pedal, nothing will happen until you lift the end of the bench top. Once lifted, the ratchet disengages and the bench can be lowered. Lower the bench to a point below the desired level. Release the foot pedal and raise the bench up to the new level. It is wise to finish any adjustment by raising the bench from a lower setting, thus allowing the ratchet rod to positively engage with a pair of teeth. Positive engagement will be signaled by a loud click. What size bench top can the Adjust-A-Bench legs accommodate? The Adjust-A-Bench system is very flexible. The rails which run lengthwise under the bench and hold the two leg sets apart, are made by you to whatever length your bench top dictates. Typically benches are between 5' and 6' long, but I know that Adjust-A--Bench legs have been used on 4' x 8' assembly tables. The rails on these are 6' long and the base was made wider by the addition of the caster package. Each caster package is made to order given your bench top's size. 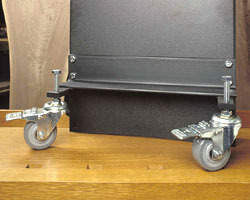 The wheels mount to a beam which is made longer or shorter to accommodate the width of your top Additionally, when the mobility offered by the caster package is not desired (note: the caster package provides more than mobility. See "what can the caster package do for my bench?" below). Provision has been made for the addition of a foot to each leg set so that wider tops may be accommodated. The built-in adaptability of the Adjust-A-Bench system allows you to give versatility and bench top height adjustment. What can the caster package do for my bench? The optional caster package is a way to add additional adaptability as well as mobility of your bench. Each leg set comes with mounting holes to accept the caster beam. These beams, made of 3" x 3" x 1/4" angle iron can be made to any custom length to accommodate wider benches. The minimum length caster beam is 17", but these have been made as long as 40'' to accommodate 4' x 8' assembly benches, to create a suitably wide footprint. The casters are mounted on 4" long hardened steel bolts which allow you to do two things. Once you have rolled the bench to a new position, turning any of the bolts can level the bench on an out of level floor. Also, the bolts can be used to fine tune the height of your bench. Perhaps you are using it as an outrigger table for some machine. Because each ratchet stop is an inch and a half apart, your top may not end up at the perfect level. By turning the bolts you can fine tune the height between the coarse adjustments offered by the ratchet stops. Additionally, the wheels can be completely retracted from the floor when maximum rigidity is needed. Can I have vises on my Adjust-A-Bench top? Yes. You will need to assess the space requirements of your vises, both open and closed when deciding where to position the Adjust-A--Bench leg spots under your bench. In some cases it may be necessary to use shin blocks to create adequate clearances for vise operation. Also, dog hole openings should not be obstructed by leg positioning.